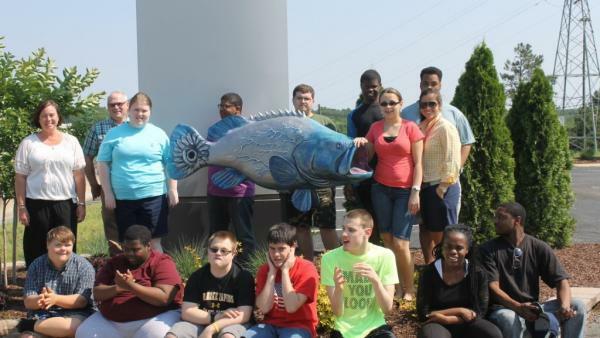 Students from April Clark’s Roanoke Rapids High School’s Life Skills class, painted the Power Station’s beautiful "Power Fish". From its water driven wheel on the tail, to the streaks of bolts running down his side, this fish produces lots of "Flash". Shown with the fish are: Sarah Evans, Process Assistant, Roanoke Rapids Power Station and Gaston Power Station Don Bromley, Site Manager, Roanoke Rapids Power Station and Gaston Power Station April Clark, teacher, with her students who helped bring the fish to the "light".